In this paper we extend the Stock and Watson’s (Leading economic indicators, new approaches and forecasting records, 1991) single-index dynamic factor model in an econometric framework that has the advantage of combining information from real and financial indicators published at different frequencies and delays with respect to the period to which they refer. 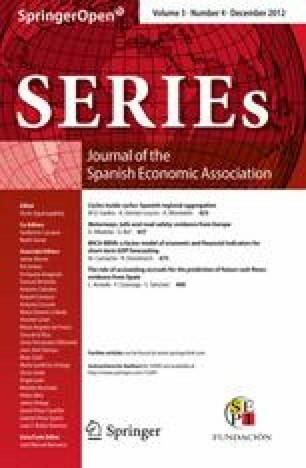 We find that the common factor reflects the behavior of the Spanish business cycle well. We also show that financial indicators are useful for forecasting output growth, particularly when certain financial variables lead the common factor. Finally, we provide a simulated real-time exercise and prove that the model is a very useful tool for the short-term analysis of the Spanish Economy. We thank M. Cardoso, I. Chacón, R. Falbo, J. F. Izquierdo, R. Méndez, J. Rodriguez-Vález and C. Ulloa, the editor and two anonymous referees for their helpful comments and suggestions. M. Camacho and R. Doménech would like to thank CICYT for its support through grants ECO2010-19830, ECO2008-04669 and ECO2011-29050, respectively. All the remaining errors are our own responsibility.